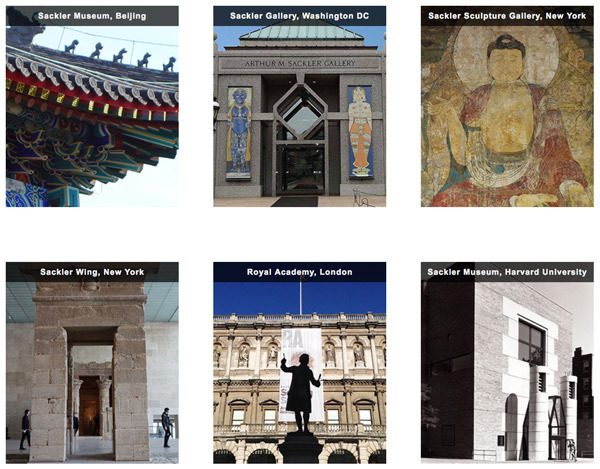 Sackler is a name I associated with sponsorship of the Arts. This is because Dr Arthur M Sackler who was a physician, scientist was also an art collector who endowed institutions of learning and culture throughout the world. He's now dead but his family continues to sponsor the arts. However, Sackler is now a name which ranks alongside BP (post the Deep Water Horizon spill) in terms of the opprobrium and level of protest at sponsorship - and gets the same extensive level of coverage. See the coverage this weekend following significant protests at the Guggenheim and Metropolitan Museum of Art. PAIN Sackler Storms Guggenheim and Metropolitan Museums for Financial Ties to Opioid Manufacturers | Hyperallergic - The drug policy advocates, led by photographer Nan Goldin, held a covert die-in at the Guggenheim, then marching to the Met to publicly protest on its steps. The gist of the campaign is this. The Sackler family wholly owns Purdue Pharma, which makes the prescription painkiller OxyContin. Oxycontin allegedly tends to create addiction and a number of people are said to have died from that addiction. In 2011 it was the leading cause of drug related deaths in the United States. Goldin is a photographer - and her work is in the Guggenheim which was targeted for protest this weekend. Her interest is that she apparently recently recovered from a near-fatal addiction to OxyContin. This weekend she continued her campaign - with the help of others - to get Art galleries and Museums to remove the name and refuse Sackler Funding. However a number of Sackler developments actually predate any development and distribution of the drug (but "why let the truth get in the way of a good storey?" The Massachusetts lawsuit is only the latest against the company, which back in 2007 first pleaded guilty to misleading regulators, doctors, and patients about the addictive qualities of OxyContin. One is left to wonder whether the Sackler Galleries at the Royal Academy in London will face the same level of protest as the American institutions which have felt the wrath of Nan Goldin. 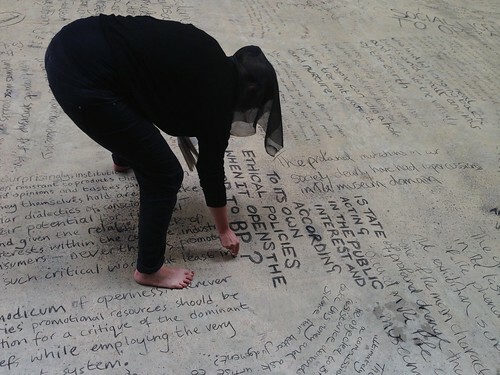 Time Piece was the latest in a series of durational performances by Liberate Tate. They create unsanctioned live art inside Tate spaces to 'free Tate from BP'. all art museums and galleries should have an ethical and rigorous approach to sponsorship i.e. none should accept sponsorship from those who attempt to get social credits through spending money on the arts to offset damage done to people and the environment elsewhere. When you put it like that it's very hard to disagree. It needs to start happening - but I guess it only will happen when the Boards of such institutions take their responsibilities seriously. I guess the next thing we'll be doing is debating giving back any donations to Museums in art form as well e.g. the Parthenon Marbles - because they were looted. Do protests like this help? Not really if they are led by one very prominent individual - because they then look like the marketing machine for that individual in overdrive and it tends to prompts cyniciam and suspicion rather than support. Yes - if they are well thought through and prompt support from a wider population (which generally means those who don't tend to like the "look at me" activities of a few). COMMENTS HAVE BEEN SUSPENDED - due to very silly ignorant people who leave spam comments without realising they have no benefit for them. Currently commenting is suspended for everybody but me which allows past comments to still be seen. © Katherine Tyrrell 2005-18 You can BOOKMARK and/or LINK to any of my sites from your site. Please respect the copyright of all artists featured here. Unauthorised use, republishing, copying or any other duplication of ANY material on this blog without written permission is STRICTLY PROHIBITED - and I do take action if you do! Please do NOT pin images from this website on Pinterest. NOT selected by an art competition or open exhibition? Writer. Author. Artist. Curator. Maven. Home Is Where the Art Is - needs a makeover! Celebrity Painting Challenge on BBC1 - who's taking part? Categories of topics/artwork are listed towards the bottom of this column - click a category to see all related posts. Who's made a mark this week? © Katherine Tyrrell 2005-18 Unauthorised use or inappropriate duplication of images or text without written permission is prohibited. Copyright is reserved on all images and text generated by Katherine Tyrrell on this blog and related sites. Please also respect the copyright of all artists featured here. Copyright is retained by the originator for all images and text generated by others and used on this with their permission or within the context of "fair use". You may quote a very short excerpt from the text only (equivalent to a short feed) PLUS include an accredited link with appropriate and specific direction to the original content and blog post. (1) purchase, licence, exhibit or display any of my artwork. (3) use ANY text or images for publication elsewhere in print or online for commercial use. This is always subject to license and fee unless by prior written agreement. All spam blogs will be reported - WITHOUT NOTICE - to Google and their website host ISP for copyright infringement. * I am an Amazon affiliate and the Amazon search box and all links to books include an affiliate link to my personal affiliate account. This means that if you buy a book as a result of clicking on one of these links I might earn a very small sum. (Income earned in this way helps me finance the purchase of new books). Copyright © 2005-2019 Katherine Tyrrell and respective copyright owners. Simple theme. Powered by Blogger.